From bustler – of particular interest is the relationship of the site to the high speed rail links and to the ecological systems of Turenscapes central wetland park, both critical for the success of the project if it is to fulfill its design intent. In an international design competiton for the rapid development of satellite cities along Chinese high speed rail corridors, Skidmore, Owings & Merrill‘s Beijing Bohai Innovation City master plan has just been named the winning submission. The Cultural Landscape Foundation (TCLF) put together The Second Wave of Modernism II: Landscape Complexity and Transformation, a powerhouse conference held last fall at the Museum of Modern Art (MoMA) in NYC, which featured some of the top landscape architects around. Now, TCLF has posted full videos of the entire conference online. Above, check out the conference introduction by Charles Birnbaum, FASLA, Founder of TCLF, who explains how landscape architects must now work with complex systems, including cultural and ecological systems, when transforming early Modernist sites into more functional, people-friendly spaces that also enhance the natural environment. While all sessions are worth watching, featured below are some of our favorite talks by landscape architects transforming Modern landscapes. Each landscape architect talks about the people who artistically influenced them, their evolution as designers, and then their own projects, which reimagine sites rich with history. While I am not fan of New Urbanism , the regeneration of suburbia is a pet interest of mine and Chris Bradford’s commentary on the problems experienced in Austin Texas from Sustainable Cities Collective highlights the real problems experienced in trying to solve the parkiing problem and how we are not prepared to pay individually or collectively to solve its problems – its probably “someone else’s” problem isn’t it? The plan called for the city hall to be built there to anchor the town center and for the rest to be filled in with apartments and boutique shops. But in 2007 the city voters turned down a tax hike to build the city hall there,settling on a cheaper location that had existing buildings. The plan was approved in 2001 and has been updated since, but the large tract of land lies fallow. D.R. Horton owns the tract and has been seeking PUD zoning that would allow it to break from the boutique-shop plan and build something more like a generic shopping center. This upset a bunch of the people who bought near the tract on the assumption that it would be a new-urbanist village. Their protests have evidently worked, for now, because D.R. Horton has taken down its rezoning application. I don’t blame the folks for wanting a quaint, urbanist town center. But, honestly, the kind of thing they want is really an urban kind of thing, and is very hard to grow in a cow pasture. There are no buildings in the town center today. Everything must be built from scratch. That means the retail must be built from scratch. And new retail space in a mixed-use village is just as expensive, if not more expensive, to build as retail bays in a new shopping center. No one’s going to build that retail space unless they get the rents to make it worth their while. And in order for the small shops they have in mind to generate the necessary rents, there must be a lot of traffic. The kind of traffic this area will never generate on its own — there are no significant job centers nearby, and there is no chance that the center will develop the residential density that could sustain a retail district by itself. The town center doesn’t even sit astride a major arterial, so drive-by traffic is out. There’s simply nothing to generate the kind of traffic retail would need to pay the rents to justify the construction cost . . . unless they were to build a lot of retail, with anchors to ensure a steady stream of traffic, and a lot of parking for all those cars. But that’s a shopping center, not a town center. Copenhagen X facilitates and disseminates information on architecture, urban development, building projects, architectural visions and innovation in the Danish capital. This movie gives you an introduction to Copenhagen X. If we’re going to think beyond the modern period, beyond the era of philosophy, society and ecology in which we have been stuck for about two hundred years, then we will have to let go of the idea of landscape as a picture in a frame, even if the picture is liquid and motile, like a movie. Why? The problem is the notion of the frame, and the distance the viewer has to assume for the landscape to appear as such. Because of this distance, the landscape embodies a subjective (whatever word works best for you here, “spiritual,” “ideological,” whatever) state. The picture is about the attitude you must assume to look at the picture. It’s less about land, then, and more about scape. It’s all very Genesis 3:6. Nonetheless, it does point to a real difference between intentionality and agency in the landscape, and compellingly suggests future landscape designs will have to grapple with this minute chasm. More hopefully, it offers the rudiments of some of the conceptual tools that will be needed in this task, specifically his defining and characterizing of the hyperobject and challenging the historical biases and weaknesses of the landscape approach. These should be further prototyped and tested and added to the good work already underway. It seems certain now that microbiology underpins everything – according a microbiologic view of evolution we (humans & their cells) are in essence “endosymbiotes”( Lyn Margulis) that have evolved to transport our microbes around the world in a more efficient manner and the Earth itself a living “sentient” being (Gaia Hypothesis – James Lovelock) composed of a balance between its physics and its lifeforms which act to ensure its biosphere maintains the precise conditions for the survival of its passengers. To think that we as a unwitting and unknowing species,we have no control of our autonomic bodily functions nor are conscious of most of what goes on daily in forming and maintaining the world above and below us, however “evolved” we think we are, have the power to destroy this magnificent place is pure hubris on our part! A system so evolved will surely autocorrect itself and use its part to engineer self correcting mechanisms – however painful that auto-corection might be for those living at the time. To become more in tune with our bodies and the invisible co-inhabitants in our cells and in the “last frontier” the soil beneath our feet, is surely the work of the future bio-engineers and bio-(landscape) architects of the later 21st century – in all the line between them will become ever more blurred, and we can in fact learn much from civilizations with more wisdom who have been more in tune with the planet and their own energies (dao -chi – prana) than Western civilization and its “science” has been to date. We are already very clear that nothing exists in isolation, and the interrelationship of the Elements of the Whole are more significant that their respective qualities when studied in a vacuum. We (engineers included) need to study the rising (Yin)energy of the sentient world more, and focus less exclusively on the descending (masculine/Yang) of the mechanistic world. Organ pipe cactus (Marginatocereus marginatus), planted here next to the mirror pool and around cochineal-covered nopal cactus, are traditionally used in Mexico as borders, corrals, and fences to keep out foraging livestock or strangers. 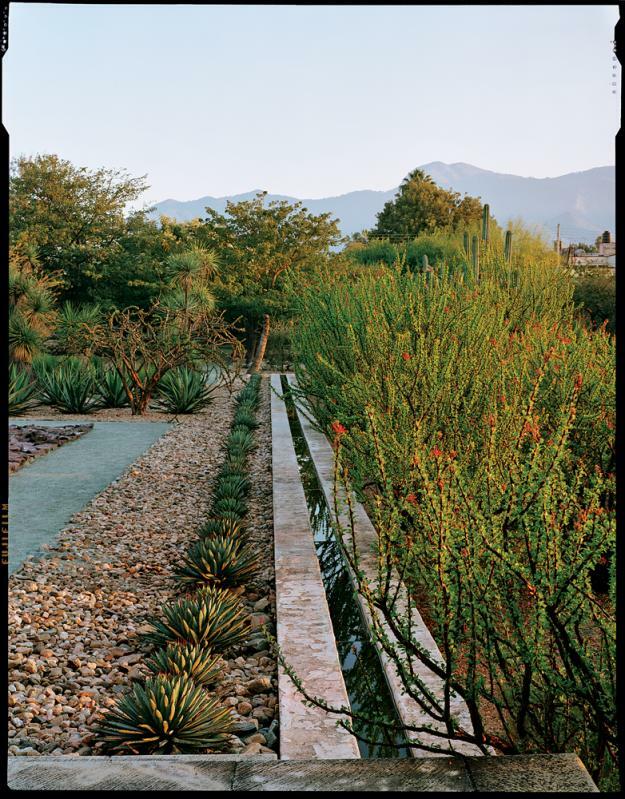 The distinctive walkways parallel a canal flanked by Agave macroacantha on the left and fouquieria on the right. The botanical garden illustrates the relationship between plants and culture, with a wide mix of plants, textures, and colors. 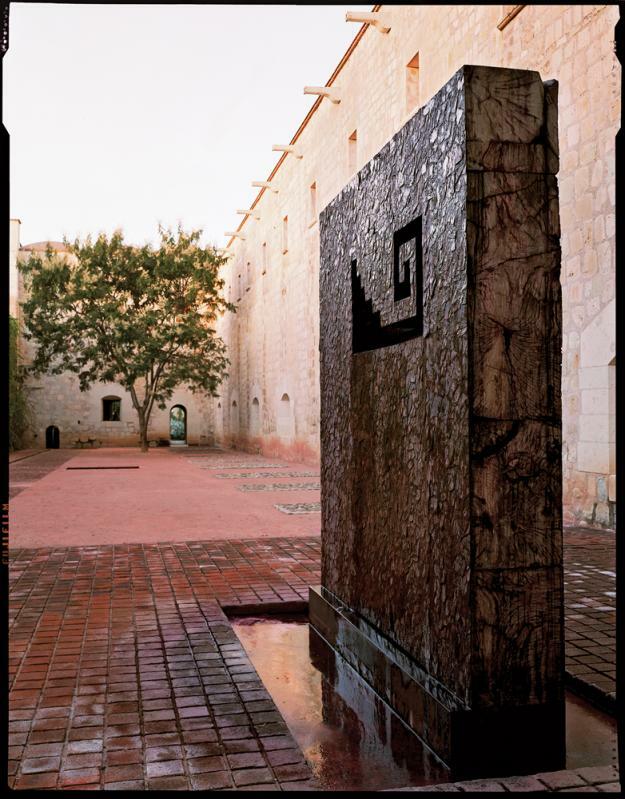 Francisco Toledo’s water sculpture, La Sangre de Mitla, is made from slabs of Montezuma cypress. 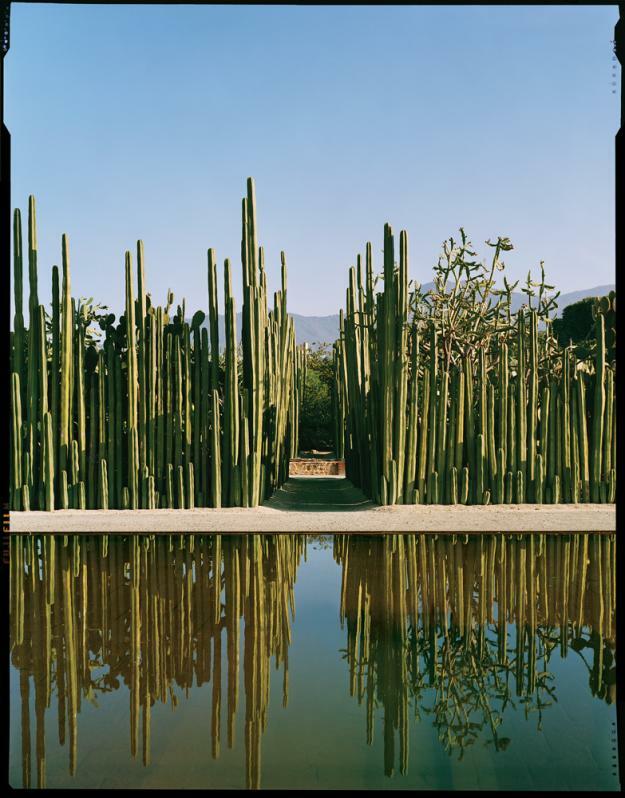 To read more about the story behind the Jardín Etnobotánico de Oaxaca in Mexico, read Jeff Spurrier’s story, Oaxaca’s Ethnobotanical Garden. From 26’10 South Architects: “Can we imagine a move towards a dynamic flexibility which can deliver subsidised housing in which the unit becomes an asset leading to income generation? The housing types proposed for Diepsloot attempt to achieve higher occupational density in order to achieve minimum displacement of residents. “The design also attempts to enable income generation through accommodating rental rooms, retail and small business enterprise. In addition ground floors are conceived as flexible spaces accommodating both trade and/or residential use. Circulation and services are positioned in such a way as to provide for these diverse occupation scenarios. This allows for economic development over time, especially along busy routes. Des Moines Water Works, working in partnership with Iowa State University Department of Landscape Architecture, recently announced that Sasaki Associates, with RDG Planning & Design and Applied Ecological Services (AES), is the winning team of the Water Works Parkitecture Competition. The Parkitecture competition, aptly named for its emphasis on the fundamental role landscape architecture and design play in re-envisioning Water Works Park, began June 2011. The international design competition entailed the creation of a conceptual plan for Water Works Park to form dynamic relationships between the river, the watershed, and the community.The competition sought proposals to integrate the ecological and social function of a park and river into a unified landscape; to inspire the community and to generate discussion about watershed issues/best practices; and offer innovative design solutions to address ecological and recreational challenges specific to Water Works Park. The design team and Des Moines Water Works will begin a concept validation process which will address specific issues and include public outreach. It is expected that a majority of the funds for implementation of the vision plan will be obtained through private fundraising and will not be borne by water rate payers. Sasaki collaborated with Des Moines-based RDG Planning & Design and Minneapolis-based Applied Ecological Services on the competition entry and will continue to do so through implementation. Collectively, the team proffers progressive design strategy, creative vision, acute regional understanding, and technical prowess.